Sancta Maria 71 - Winklespruit Accommodation. 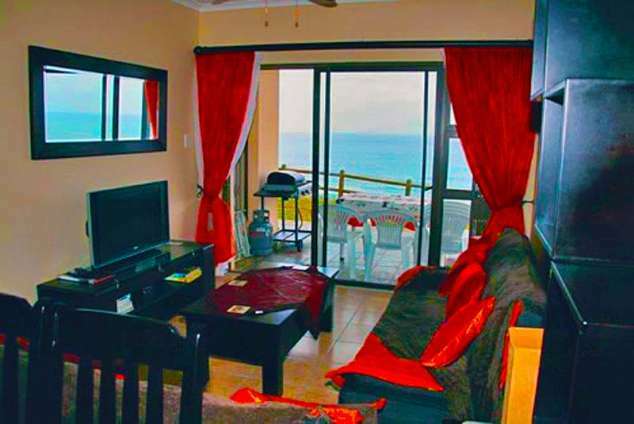 Unit 71 is a 3 bedroom, 2 bathroom, self catering apartment, in a large complex, with 24 hour security. The apartment is situated on the ground floor, with a breathtaking, 180 degree breaker and sea view from a private patio, where dolphins and whale are often sighted. It is situated on the beautiful beach of Winkelspruit in Amanzimtoti - nestled amid the extraordinary natural beauty on the South Coast of Kwazulu Natal. The complex offers secured, controlled access, a splash pool and access to the beach, down a path which is out the main gate and next to the complex - The main swimming beach with life guards is situated about 700 metres from the apartment. Although there is a semi private beach in front of the complex, down the same path. Sancta Maria 71 also has two covered parking bays. The main bed room offers, BIC and a queen-sized bed and en suite full bathroom, which includes a beautiful beach view and opening a sliding door, onto a small covered patio. The second full bathroom accommodates a washing machine and tumble dryer, for your convenience and services both the second and third bedrooms. The spacious kitchen is fully equipped and includes a fridge / freezer, microwave, dishwasher to make your stay as homely and as comfortable as possible. There is adequate cupboard space. The dining room has a dark wood table and six chairs to enjoy your family meals or get together. The decorative furnished lounge comprise of sleeper couches, LCD TV, with full Dstv and a sliding door opening onto a covered patio, where you can enjoy a meal prepared on a braai / bbq. All rooms are equipped with ceiling fans, bedside lamps and side tables. 43479 page views since 16 Apr, 2010.